The Northern Lights series by Fallkniven is rapidly gaining currency in the world of knife manufacturing with models named after the Nordic Gods and with no expense spared for quality and appearance. The F2 knife is named after the God Oden who together with Thor is considered as the highest ranking god in Norse folklore. Oden was the father of the Gods as well as of mankind whilst riding on his legendary eight legged horse called Sleipner. Oden was also accompanied by the two ravens, Hugin and Munin who are the bearers of knowledge and he is the undisputed ruler of the kingdom of Valhalla. So the knife has quite a lot to live up to but with the latest revolutionary VG10 steel the NL2 is definitely a powerful and very adaptable knife which has an excellent striking action and does not feel clumsy at all. Fallkniven insist that the Northern Lights series breaks new ground in the philosophy of knife manufacturing since there has been no expense spared to make these knives as powerful but at the same time as attractive as possible. They are a thrill to look at and also a huge pleasure to use, something which is immediately apparent when you handle the NL2. The blade is a world first in that it consists of laminated VG10 steel with an edge of the world famous VG10 variety and sides consisting of incredibly tough all stainless 420J2 steel. This is definitely the best combination for a blade since it combines all the characteristics which make a blade tick such as resilience, resistance to torque and superb edge durability. The laminated technology actually increases the blade strength by 25 per cent in its resistance to bending when this is compared to an ordinary VG10 blade thus ensuring quality which no other knife manufacturer in the world can hope to come close to. An important part of any knife is its handle and here the N” has one which is made from ox hide, a material which is usually overlooked by knife manufacturers but which gives a superb and rugged grip. It also ages quite well acquiring a pretty attractive brown patina and it is also resistant to water and is never affected by oil or other solvents. Fallkniven are persisting with the convex edge for their Northern Lights series since this is considered to be the best combination for edge strength as well as performance. Anyone who knows a thing or two about knives will know that such an edge can only be made by knives so this edge is truly unique and the best in quality when compared to 99.99 per cent of other knives. These are usually mass produced using CNC or Computer Numerically controlled grinders and robots which shape the blade as best possible. Such machines are usually loaded with stacks of blades and work for 24 hours aday churning out thousands of blades but the quality is obviously just that little bit compromised even though it is obviously cheaper. The NL2 is a top drawer strong, corrosion resistant and durable edge knife of the absolutely highest quality which is not machine made but painstaking constructed by skilled knife makers using the very best traditional techniques which ensure high quality craftsmanship throughout the whole process. 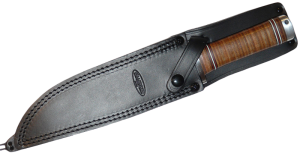 The NL2 comes with a black leather sheath which is also of the utmost quality.